Update your Account and Preferences with your preferred details. Once you have established your account’s details and preferences, the information is available in your profile under Discussions. Class members can view others’ profiles by clicking on a user’s name and under Member Listing or by clicking a user’s name by their post. Additionally, site members can see the total number of topics a user has posted. 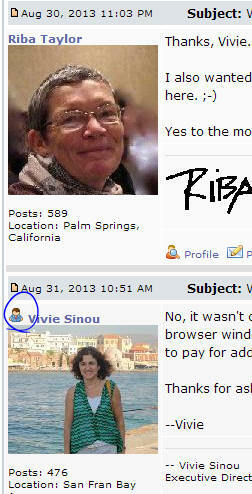 In the posts of instructors, there is a little person icon by their names to differentiate them from students. In the below example, Vivie Sinou is the instructor. You can update your Account and Preferences at any time. The changes will be reflected globally in all your course sites. If you have posted messages in forums, your adjustments to your profile will be updated in your posts, member listing information, etc. in all the course sites.